Welcome to the i3Factory Music World! 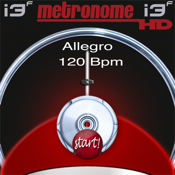 The HD Metronome has all standard and extended metronome tempos from 5 to 250 BPM! Just press Start! The fist one with Tap Tempo option and Classic, Bongos and Bell sounds. A metronome is a tool that produces a steady pulse (or beat) to help musicians play rhythms accurately. The pulses are measured in beats-per-minute (BPM). Most metronomes are capable of playing beats from 35 to 250 BPM. Common uses of the metronome are helping you to maintain an established tempo while practicing, and learning difficult passages.